R&S Biomass have been the main importers for Froling biomass boilers on the island of Ireland since 2009 – but have now joined forces with MGW Energy to recently launch Biomass Engineering Ltd at the Energy Show in Dublin. 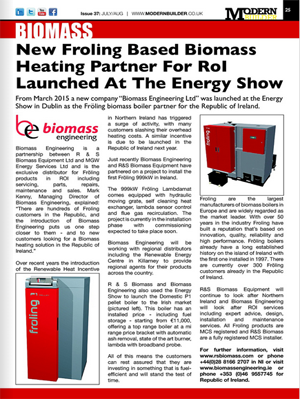 New firm Biomass Engineering will be the Froling agent for the Republic of Ireland based in County Meath. The decision was taken to set up the company to concentrate on existing Republic of Ireland customers and market. “There are hundreds of Froling customers in the Republic, and the introduction of Biomass Engineering puts us one step closer to them – and to new customers looking for a Biomass heating solution in the Republic of Ireland.”Over recent years the introduction of the Renewable Heat Incentive in Northern Ireland has triggered a surge of activity, with many customers slashing their overhead heating costs. With pledges made in the Government’s Green Paper on Energy Policy of establishing a similar scheme in ROI for 2016 for commercial customers, R & S Biomass and Biomass Engineering feel that customers can be assured that their investment will be sound, as Froling boilers that were installed since 1997 can be seen in operation. Biomass Engineering will be working with regional distributors including the Renewable Energy Centre in Killarney to provide regional agents for their products across the country. R & S Biomass and Biomass Engineering also used the Energy Show to launch the Domestic P1 pellet boiler to the Irish market(pictured left). This boiler has an installed price – including fuel storage – starting from €11,000,offering a top range boiler at a mid range price bracket with automatic ash removal, state of the art burner,lambda with broadband probe. All of this means the customers can rest assured that they are investing in something that is efficient and will stand the test of time. Froling are the largest manufacturers of biomass boilers in Europe and are widely regarded as the market leader. With over 50 years in the industry Froling have built a reputation that’s based on innovation, quality,reliability and high performance. The Froling range of boilers include Log gasification, Pellet and Woodchip ranging from 8-1000kw. R&S Biomass Equipment will continue to look after Northern Ireland and Biomass Engineering will look after ROI services including expert advice, design,installation and maintenance services. All Froling products are MCS registered and R&S Biomass are a fully registered MCS installer. For further information, visit www.rsbiomass.com or phone +44(0)28 8166 2707 in NI or visit www.biomassengineering.ie or phone +353 (0)46 9557745 for Republic of Ireland.